Yesterday Wyndham Hotels announced that changes are coming to their Wyndham Rewards program on May 11, 2015. The new Wyndham Rewards programs takes a step that is needed in the industry. It simplifies the program for the masses and makes it very easy to understand. Along with this simplification however there is some great news and some bad news. In the first point, "Go Free" award is where we find the good and bad news. The first part of the good news is the simplicity, 15,000 points gets you a free night at any hotel at anytime as long as rooms are available. No categories to worry about and no low and high season point fluctuations to consider when redeeming. The second part of the good news is that the really high end properties are now achievable by many as you'll only have to redeem 15,000 points for them rather than upwards of 50,000 points! Granted it was only a few years ago when these high end properties only cost around 16,000 points per night but were devalued in the last program change. Essentially we see 6 categories get cheaper with this new redemption rate. The bad news is that four categories get more expensive and these are typically hotels that you wouldn't want redeem 15,000 points for! Could you imagine paying for 15,000 points for a Super 8 that goes for $79 a night when you could use those same 15,000 points for an all inclusive Wyndham Resort that goes for 5 times that. 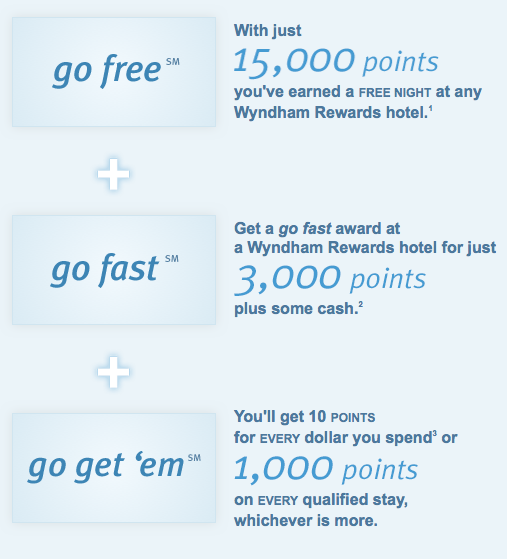 Point two "Go Fast" has Wyndham introducing a Cash+Points feature that we see in many hotel programs. This could be good or may not be as we aren't aware of the cash requirements yet that will go along with the 3,000 points required. The third point or change is that as a Wyndham Rewards member you will now earn a minimum of 1,000 points per stay. 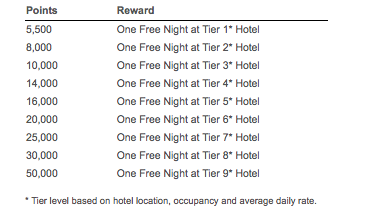 The earn rate hasn't actually changed, you'll continue to earn 10 points per dollar spent but if you are staying at that $79 a night Super 8, you'll earn a minimum of 1,000 points instead of 790. Of course if you stay at a location over $100 you'll earn the 10 points per dollar amount. Overall this is great news from the Wyndham Rewards program. We love the simplicity they are promoting and make the program stand out in the big sea of confusion that loyalty programs tend to be! One thing you can bet however is that not many people will be redeeming for Super 8 stays anymore and will be saving those points for stays at higher end hotels! Read more about all the changes here. What do you think of the new Wyndham Rewards program? Will you switch your loyalty from another brand to Wyndham?